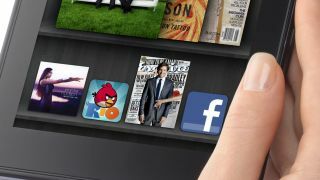 Amazon Kindle Fire 2 arriving in August? The much rumoured Amazon Kindle Fire 2 may be with us in time for our summer holidays if the latest reports are to be believed. According to China Times, the first batch of tablets, estimated at 2 million units, could start shipping on August 7. The report goes on to confirm that the Kindle Fire 2 will pack a 7-inch display and will be priced at the same level as the current Kindle Fire, $199 (converted this around £130). Amazon needs to move quickly, as the Google Nexus 7 is about to steal the budget tablet limelight with its quad-core processor, 1280x800 screen and price-matching cost of $199 (exact UK pricing was £159). The Nexus 7 will be available from mid-July, giving it the upper hand in the low-cost tablet battle and we hope Amazon can produce a slate which will give Google some decent competition. We've also heard rumours about bigger Kindle Fire tablets and the report goes on to say that 8.9-inch and 10-inch models are still being considered, but it's the 7-inch version which is getting priority at this time. You can keep up to date with the goings on with our Amazon Kindle Fire 2 release date, news and rumours article.